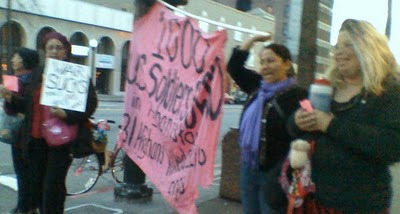 There was NO RECRUITING our youth at the MRS in Berkeley that day, Wednesday, Feb 24th, to go off to war! The MRS was dark, the doors locked, and the iron gate secured over the entry way. The entire MRS was totally SHUT DOWN in anticipation of our Wail In Commemorating and Protesting the 1000th U.S. soldier death in Afghanistan, the 10's of thousands of Afghan deaths, and the horrific "500 a month U.S. Deaths" coming in June. For recruiters cannot afford to allow those in danger of being recruited to know the truth about the number of US deaths in Afghanistan, as well as the predicted heightened risk. 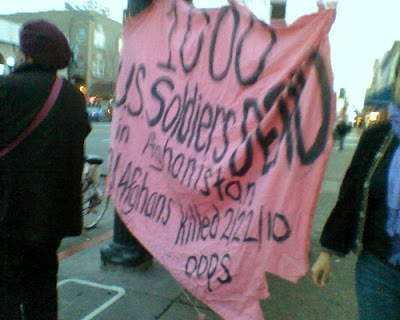 At a previous demonstration, one such youth told us a recruiter told him only 10 U.S. soldiers had died at a time when really hundreds were dead. KTVU news, Channel 14, and KPFA all interviewed us about this protest and why 1000 was an important number. We answered by asking them how many times since the invasion of Afghanistan have they come out to cover our protests and why were they here today? We also invited the media - and everyone - to return next Wednesday, and EVERY Wednesday, to step up our protest to END WAR before Afghanistan turns into another Iraq. Normally we protest every Wednesday from noon to 1. We are now extending our protest until 2:00pm, broadening it to include lunch! We are taking turns bringing lunch at 1pm - feel free to drop off some food even if you can't stay! Along with sharing lunch, we will be holding a "work session" out in front of the MRS from 1-2, making banners, posters, flyers - and anything else that needs doing.